Check out what people are raving about. 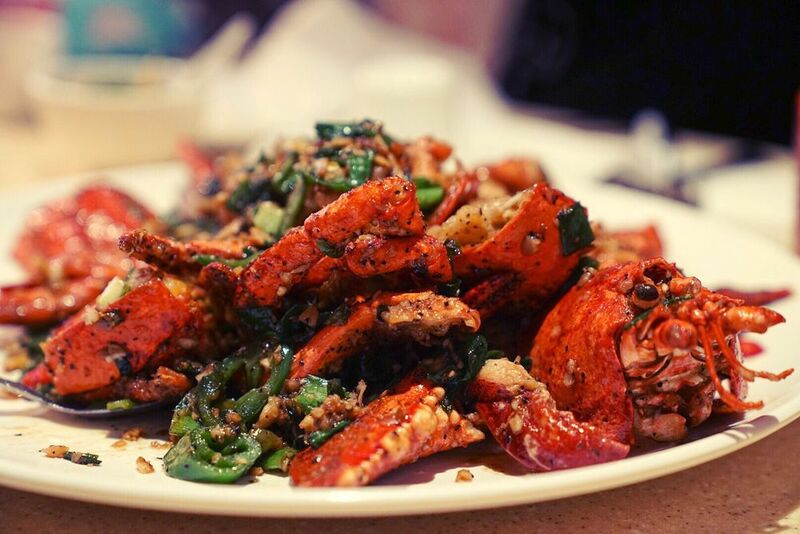 Newport Tan is one of the most acclaimed Chinese restaurants in the San Gabriel Valley, especially known for its house special lobster. It’s smart to come with a large group so you can order a variety of seafood, such as fish with basil-and-walnut shrimp. If you’re craving red meat, the filet mignon cubes are outstanding. A legendary dish that draws crowds every night, this stir-fried lobster, pulled live from massive tanks in the front of the restaurant, is a classic Cambodian-Chinese showstopper with green onions, ginger, and garlic. Everyone will fight for the tails and claw, but the true aficionados go for the the head, best eaten with some sauteed greens and bowl of fresh rice. In today’s chef-driven culture, significant attention and praise are given to the culinary brains behind the stove, and here that credit belongs to Lam’s husband, Ly Hua, who developed the restaurant’s signature dish, a massive Maine lobster blasted in a wok with green onions, jalapeños, black pepper and clarified butter. Newport Seafood’s Spicy Lobster — There are other things on the menu at Newport Seafood, and some of them are even good, but the Vietnamese-Chinese restaurant, which occupies a remodeled Marie Callender’s, might as well have no menu at all: The throngs, most of which have waited a couple of hours for a table on a Saturday night, are there for the house-special lobster, a mammoth beast fried with chiles, black pepper and scallions, a dish as essential to Newport Seafood as chili dogs are to Pink’s. At this family-run restaurant, the menu — in English, Chinese, Vietnamese and Thai — expresses the cultural blending that is the experience of the Chaozhou Chinese, who migrated to Southeast Asia in the 1850s. There are influences from Cambodia and Thailand, resulting in seafood fare that is refreshingly light. Newport Seafood is an SGV classic. It’s an upscale restaurant, popular with families out for a nice Sunday lunch. And when you’re out for a nice Sunday lunch here, you should be ordering the whole lobster. It’s covered in spring onions, chilli, and ginger, and the smallest one you’ll be offered will be at least four pounds. That doesn’t mean you should ignore the rest of the menu – the peppery, slightly sweet Beef Lak Lok needs to be ordered too. My friend and I were visiting Mission San Gabriel and were getting hungry, so we checked her phone and I suggested we try this place. But hey, I've never eaten here before, so how would I know? I only wish the shrimp had been a bit spicier. I'm known for liking things so spicy that consumption of them could cure the common cold - or at least unstuff your nose for a few hours. Service was also something I wasn't used to. We had soup served to us before we even ordered. But hey, I only had Pop Tarts for breakfast that morning so I was REALLY grateful for that soup. All in all I'd probably eat here again if I ever got up that way and I'd be better prepared for certain things. I have to give 5 star all the way. First glance the wait seems a bit much. But then you see how friendly the staff are and how excited the customers are then you begin to smile as you see the food being served to others. It's unlikely any typical Asian food restaurant. The attitude of the staff are like family. The food is fresh and unique taste. Amazing place to large groups. Prices are very reasonable. 7 of us dined very well and completely full for $140 excluding tip. Thank Bobby the manager for the great experience. Your staff are your treasure. Newport Seafood is one of the best known Southeast Asian/Chinese seafood restaurant in SGV that doesn't need another review but I always like to rave about a good experience (or experiences because I've been coming here over 10 years). Newport Seafood is definitely a five star - but a somewhat pricy five star for Chinese seafood. Everything here is good. Popular dishes are the Newport lobster and crab. Their other lobsters and crabs are equally good. I have tried them all and they are all delicious. If you like fish, they have a terrific House Special Sea Trout that is deep fried and smothered with their special sweet and tangy sauce that pairs perfectly with steam rice. If you like a lighter fare, ask them to steam the fish. (Secret alert: if they have big enough fish, they can steam half and house specialize the other half.) Clams with Spicy Hot Sauce is another great dish. For those who prefer to stay with turf and less surf, Newport has plenty of options. Beef Loc Lac, which other Yelpers rave about too, is yummy. It's chunks of steak that are slightly crispy and marinated with a thick soy sauce sitting on a bed of sliced onions. Even the basic Kung Pao Chicken is special. The chicken is tender on the inside, slightly crispy on the outside and nicely marinated. The deep fried tofu is also a popular dish/appetizer. Seriously, Newport Seafood will not disappoint. It's family owned and operated. The only things that have changed since ten years ago are: they accept credit cards (but not back in the day); they've upscaled their decor since their last location; and they are so popular that now they have valet parking! One last note, go their early on the weekends because there usually is a wait... Enjoy! Food 9/10 so many people come here to order the Newport lobster and they definitely earn their reputation. It's so flavorful and fresh. By default they give a small lobster for 2-4 people and it's around $80. They way the cook it makes the most use of the meat! I also really like their Chinese broccoli. Honestly the steamed fish and shrimps I tried are ok.
Ambience: ok Chinese restaurant. They have private rooms for big party upon reservation. Service: I think they're understaffed. We come around 2 for lunch but still feel busy here. Note: they have its own parking lot with complimentary valet. Be prepare to wait if you come during peak hours. I hate lobster but I LOVE it here!!! You know a restaurant is truly world class when they can make you drool at the thought of eating something you don't like. I scoop out the sauce and wonder who was crazy enough to come up with the idea of putting an insanely delicious sauce on a high quality lobster. If you have ever been to a Michelin star restaurant you will know lobster never comes with a sauce and if it's integrated into a small dish as part of the menu degustation then it's light and clean. I love that at Newport tan its unapologetic and just a massive amount of lobster with sauce in your face about to be stuffed down into your belly with reckless abandon. The only problem before was parking was a pain but they have Valet now! Go early or off times to be seated immediately or be prepared to wait 1-2+ hrs. This is a busy place and the seafood is great! We loved the crab in black bean sauce. and the shrimp with garlic sauce. The food is spicy unless you tell them so be sure you order your beverages fast. If you like spicy food, try the sweet, sour and spicy cucumber appetizer. My hot date got hotter when he ate this. The staff is so nice and helpful. Ask them for suggestions and you won't be steered wrong. We are so fortunate to live in an area with the best Chinese food! Hands down the best lobster in town. Line is crazy long, so try weekday lunch time AFTER 1pm. You will find it much easier for parking and getting a table at a timely manner. Ofc you have to order the house special lobster. I would also suggest some fried clam to go with it. Oh yeah, they also know how to do veggies right. Feeling fancy? The food (and in particular the lobster) is so undeniably good! I came here with the boyfriend, and although this place seems like a traditional family style restaurant, we still were able to have a fantastic meal between two people. We kept our order simple - we ordered the signature lobster with chili sauce - which we were told the smallest ones run 3-4 pounds. Ours ended up weighing out to 3.25 pounds and we weren't able to finish it all! We also ordered a size of rice, beef, and Chinese broccoli to go with the meal. The sauce on the lobster was thick, and was served up with sliced scallions (which were slightly over cooked imo, but nonetheless amazing). I think this restaurant really kills the game in quality of lobster - they're kept in tanks to be served fresh - and also amazes with their savory, amazing sauce. All in all, a must try for all seafood fans! Newport Seafood is essentially a classic and a personal go-to whenever I'm in LA. Favorite dishes here include the Newport Special Lobster (obviously) and Beef Loc Lac. I'm also a huge fan of the spicy clams, fried calamari, and large pea sprouts. All of the dishes here are so delicious and flavorful, yet not overpowering. Don't forget to get the lobster over noodles, or with a bowl of rice to scoop up all of the extra green oniony goodness!